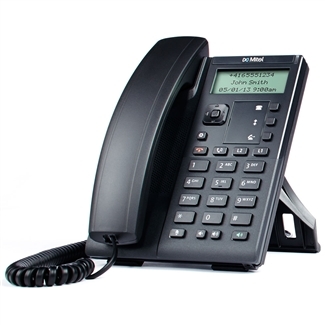 This model of the Mitel 6863 has been professionally refurbished and comes with a one-year third party warranty. All components have been thoroughly checked, tested, and disinfected. The firmware has been updated to the latest release. Every phone has been cleanly packed and comes with a quality control assurance sticker. Mitel 6863 is a 2-line entry level IP phone that supports the open SIP protocol, giving you maximum choice of VoIP platforms. An exceptional value, Mitel 6863 delivers enterprise-class features like Mitel Hi-Q audio technology for rich, wideband audio via the hearing aid compatible handset or the full-duplex speakerphone. Mitel 6863's 2.75" display is familiar and makes using the phone simple. Also simple is powering the phone through your Ethernet network using PoE. From QoS support for data optimization to secure HTTPS provisioning, Mitel 6863, formerly Aastra 6863i, is a basic VoIP phone that fits on any cubicle or desk.